There are various companies that use Singapore as a base for their business developments in ASEAN countries, and many of them have their regional headquarters in Singapore. In order to offer effective legal solutions to support such companies' needs for smooth business operations in each country of the region, Nishimura & Asahi Singapore Office offers extensive legal services in the areas of M&A, disputes, finance, general corporate assistance and others in liaison with Nishimura & Asahi's other local offices and local lawyers in external law firms in ASEAN countries. Each case is handled by our tailored teams comprising our lawyers and local lawyers that we carefully select from external law firms in accordance with the characteristics of the case and the client's demands. Our reputation has been proven by a strong track record. Nishimura & Asahi Singapore Office also serves inbound needs for non-Japanese clients into Japan by teaming up with Nishimura & Asahi’s Tokyo-based expertise teams; among others, recent cases include investments by Singapore clients in the Japanese real-estate market. 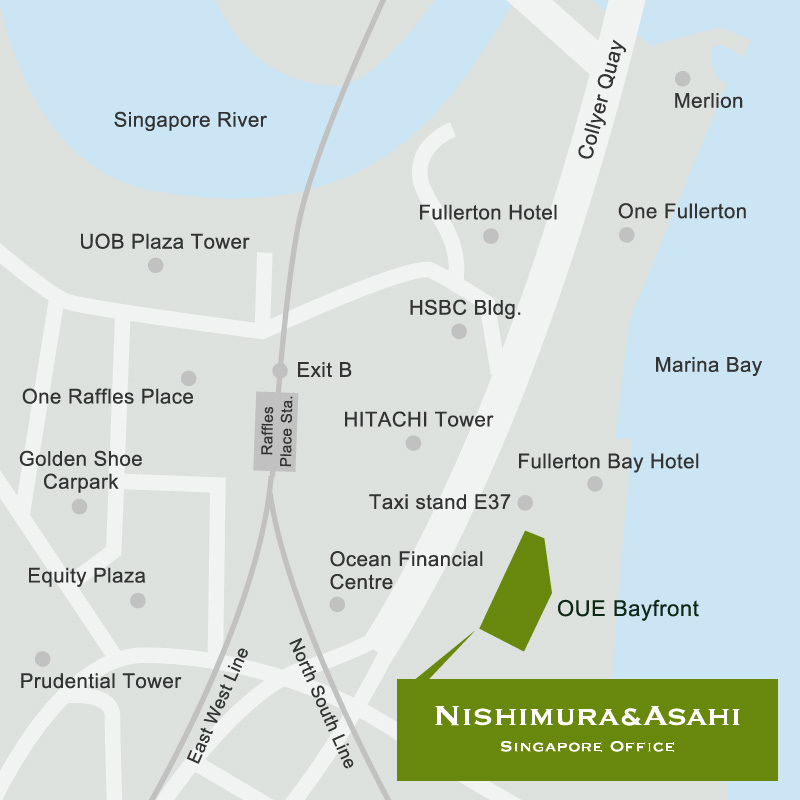 Nishimura & Asahi Singapore Office consists of lawyers with specialist practice areas, including those seconded from Nishimura & Asahi in Japan, to be able to provide a full range of legal services to clients. Singapore-Malaysia Practice Team provides extensive legal assistance to clients in areas including M&A, real estate, conflict resolution, and finance by teaming up with local lawyers. Indonesia Practice Team assists clients in cases of dispute and risk management, M&A, and finance in Indonesia by teaming up with local lawyers. Litigation Team has extensive hands-on experience concerning litigation, arbitration, mediation, etc. in local countries such as Singapore and Indonesia. Cross Border Construction Project Team has a proven track record of dispute resolution and legal advice on agreements relating to cross-border building and infrastructure construction projects, and ODA projects in Southeast Asian countries. Philippines Practice Team assists clients in cases of M&A, joint ventures, finance, labor and corporate & commercial transactions in Philippines by teaming up with local lawyers.